.01 Wow! This is a sweet kit- easy to build with nice crisp details. This is my first Wave kit and it is everything others say. I didn't snap WIPs of the build because it's pretty straight forward and fast. Started now so to show PE detailing and the painting as I go along. 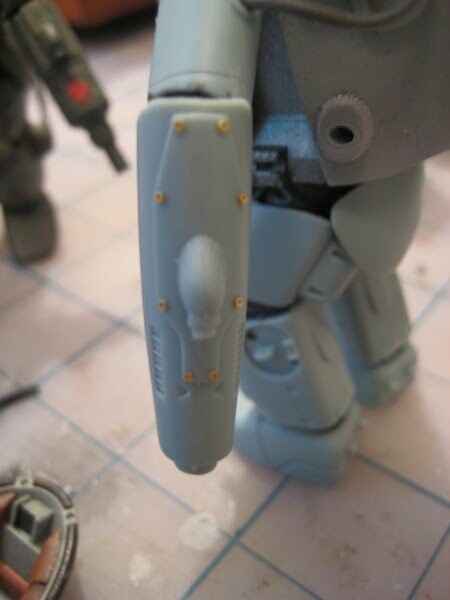 Next step after all parts have Tamiya base, I'll hit the panels and crevices with some shadowing. Then after add some Testors acrylic white primer on all surfaces. My idea is to layer the colour as you would on a real hardware. 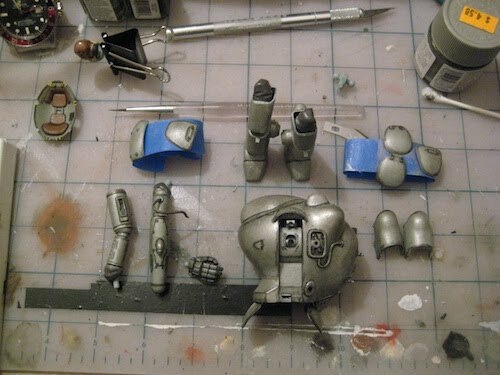 .03 All the pats are done now in Tamiya Titanium Silver, details shadowed and ready now for the Testors White Primer. 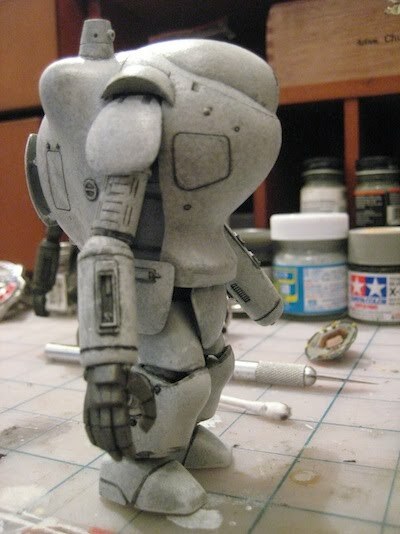 .04 Primer coat applied over Tamiya with Testors White Primer applied with a stubby brush by blotching. I also reapply shadowing. I am strarting to wonder though if this processes is worth the extra steps and material. .05 Final Coat complete by hand brushing with a stubby brush, blotching surface. 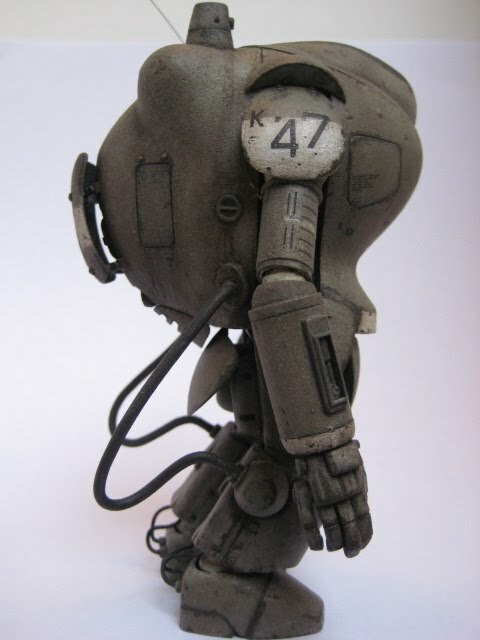 I used Tamiya Light Grey thinned with Tamiya Acrylic thinner. For the white tipping/markings on the engine cover and shoulder plates I used again Testors white primmer. The top of the hatch is Tamiya Nato Black. I am considering calling this guy "Moe". Next up are the decals. .06 Markings added and some chipping/weathering started. The panel lines are nice and deep with this kit making detailing, at least for me easier. The layer process (silver base, primer coat and final coat) which I wasn't sure would make much a difference actually has. Pipoo De Kloon is right- No pain no gain! .07 Not much in way of steps but much more chipping and some weathering with chalks. 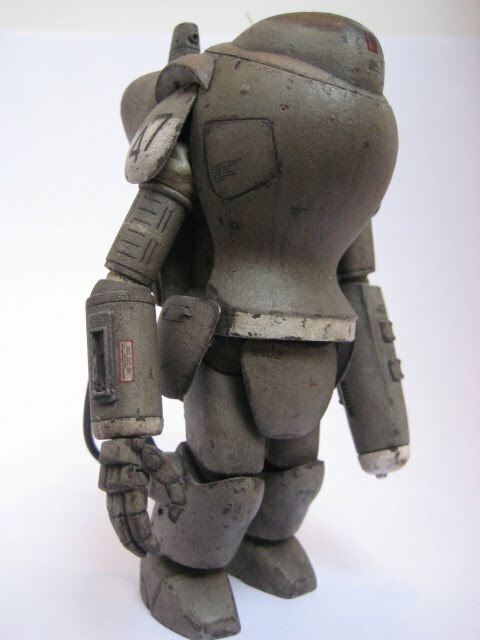 I used some Tamiya Thinner with the chalk dust to get a paste going and applied it to represent discoloured steel or rust spots here and there. Then I seal the area I have applied the chalk "paste" with Testors Dullcote. .08 Am done yet? I am not sure... I worked the filters with oils as well as added pigments for dusting. Love playing with the oils, love the smell and mixing them, however I am not sure if I am completely satisfied with how I used them even though I watched some online demos. Maybe I'm expecting more... maybe I just need to practice a WHOLE lot more. BK recommended I use some blue over the armor which I didn't do yet, but maybe will try now being I got a complete set of oils as a gift a few days ago. I did as he suggested with sienna around the engine area which looks like the paint is scorched from heat. Let me know what you think and any pointers are always very appreciated.